Among the requisites that you failed to list is the sum of US$ 23.75, which is the current cost of a Consumer Edition license, just for the record. BTW you're doing false advertising - the product cost is $29.95, not less. Also the free tool I provided lets you not only update, but also extract, winre.wim. Not at all hounding anyone. Good to know that the product can be used for free (limited to using the WIM compression), and good to know that your nice little tool has more uses. Still, devadev's post has all the characteristics of a SPAM post, particularly because he posted it on several boards and he should IMHO be aware ot that. the risk of being "labeled" as SPAMmer is concrete. The entire ZIPmagic suite can be used for free during the 30 day trial, and that includes not only DoubleSpace for WIMBoot compression, but also DriveSpace for NTFS compression, Stacker for data deduplication, and the full archiving suite. Also keep in mind that when you do order, you don't get billed for the first 30 days and you can opt-out of billing any time - so this gives you an effective 60 day window for a free trial/free use half/half. Today, there appears to be an attack going on against all non-mobile software costing more than $1. Not every commercial software vendor owns a private island!!! Of course, Erwan! I'm sending you a license via PM right now. I have been following your work since day 1 (your battle with your windows tablet) : impressive work. You have been working this new WIMBOOT feature in and outs. Well, I don't believe it will ever be possible to make un-crackable software. A human invents protection; another will invariably crack it. So I find it a futile effort on the part of all DRM'ers - they are just actually making things harder for their *licensed* customers, and not the crackers. ZIPmagic's own protection is key-based. This is trivial to crack...my position on this is; if someone who can buy the software finds a crack, (s)he will most likely buy it anyways. OTOH, if someone doesn't want to pay, they never will - so why make things harder for my own customers, who are actually willing to pay - by employing draconian DRM? BTW looks like I missed your data dedup question. ZIPmagic's Stacker is the data dedup product. This too is a wrapper around Microsoft technologies, but unlike DoubleSpace and DriveSpace, which actually extend WIMBoot/NTFS compression in many ways; Stacker doesn't do much extra other than being a glorified UI around data dedup. It is primarily intended to enable customers running Windows 8.0 or Windows 8.1 (only 64 bit is supported with data dedup) to use data dedup without having to use the Powershell command line. Unfortunately, due to legal issues, it is not possible to automatically enable data dedup on Windows 8.x - data dedup is available only with Server 2012 (R2). I'm sure if there's a legal way to simplify this setup for Windows 8.x users, jaclaz will be the first to let me know, and I can include that in the ZIPmagic suite as well. But I doubt it! Well I was under the impression that DoubleSpace is a (extremely polished and seamless)"glorified UI around"(your words, not mine ) WIMBoot... Can you just list out how it extends it in many ways? Whoa data dedup built into windows? Hadn't heard of it, but reading up it seems that it's a feature only on Windows Server. So how are you providing it in Windows 8? Or are you? Edited by milindsmart, 02 September 2014 - 10:51 AM. Quoting simonking, "Unfortunately, due to legal issues, it is not possible to automatically enable data dedup on Windows 8.x - data dedup is available only with Server 2012 (R2)." It can be tweaked however into Windows8 (see links above). But we are deviating from the topic : Wimboot technology and related tools, methods. Maybe I'm a little dense, but why exactly is WinPE 5.1 required? Only to capture, and apply in WIMBoot-style right? So can I do all this from another full windows 8.1 instance, if I already happen to have it? Edited by milindsmart, 02 September 2014 - 11:29 AM. 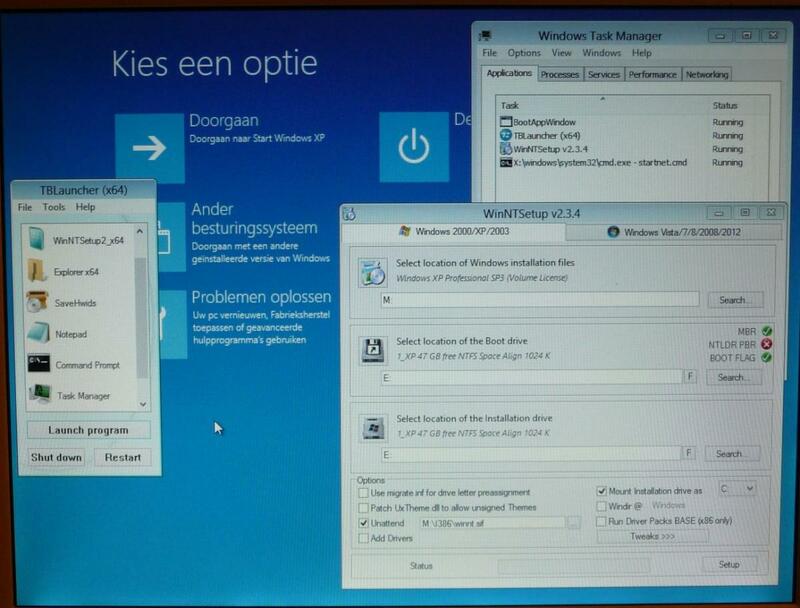 You need a win8.1u1 based winpe to apply/capture a win8.1u1 O.S with the WIMBOOT flag. You perform this task offline (or else can use SimonKing tool). Or else you can that same task (still offline) using wimlib from any winpe (see here). You need PE 5.1, with or without wimlib, when you are trying to recompress a disk that has been previously compressed. If you don't have PE 5.1, then you don't get the WoF driver. If you don't have the WoF driver, then you don't get to access the already-compressed data on disk; because this data can only be served correctly by the WoF driver. Thus the need for PE 5.1; but if you don't need to recompress, you wouldn't need PE 5.1 anyways. And of course another instance of Windows 8.1update1 (i.e. with the WOF driver) would do instead of the PE 5.1 also for this. But since the WOF driver is used to access/mount the already compressed data, the need is just for "in place" recompression, i.e. if a "spare" disk with enough space is available, one could always - in theory - apply the compressed .wim to this temporary space, and then recompress it by re-capturing it with just Wimlib from *any* other supported OS install - possibly including a Linux, even without the WOF driver, right? I don't know about Linux, but yes, on Windows, as long as your instance has the WoF driver up and running, it should work. In our chats with Eric he was telling me that it could also be possible to adapt wimlib to interpret pointer files correctly even when the WoF driver is unavailable; but that this would require an exorbitant amount of work for what we've already been able to solve with the WoF driver. No, I guess we are saying different things. Without the WOF driver WimLib can apply an image that has been compressed with the /wimboot flag to an available (big enough) volume, right? Still without the WOF driver WimLib can capture an image of an available volume with the /wimboot flag, right? The /wimboot option does exist in the Linuix version of WimLib, or it is reserved to Windows version? It cannot capture if the WoF driver is not installed and you're trying to capture a WIMBoot volume. It doesn't know how to interpret the pointer files without the WoF driver. At least on Windows, Eric can clarify if the case is different on Linux, but I doubt it since the codebase is most likely the same. I did capture and apply a wimboot file with wimlib using a winpe 4 or 5, just like wonko is saying. See my link in previous post. You don't need the wof driver with latest wimlib. You can. What you won't be able to do is properly capture a WIM from a system that has already been WIMBoot'ed, because wimlib doesn't know how to interpret the data, just as any other Windows app, without the WoF driver. Instead of using Win8.1U1 based WinPE/WTG, there is also a way in order to apply/capture 'Win8.1U1' with WIMBoot flag. Thus the need for PE 5.1; but if you don't need to recompress, you wouldn't need PE 5.1 anyways. I just built WinPE 5.1 the DISM way, and I now see the value in doing without it - it takes AGES to update boot.wim with all the updates! About 4 hours overall I think. The Windows 8 Refresh-PC works without formatting the drive at all.. It's mainly an application of a WIM on the boot drive. I was wondering if formatting is necessary. One point is of course the appeal of wiping out the drive and starting clean... But also it's the time taken to delete files... reformatting is faster and predictable in the time it takes. Besides, refresh requires enough space to hold both the old and the new installation.